Clean metal filings and stubborn stains with the Eraser Block from Lansky. 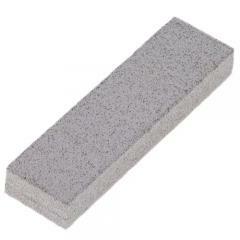 The pliable, abrasive block is designed as a companion accessory for the alumina ceramic Crock Stick® sharpening rods. The block removes metallic dust and filings that build up during the sharpening process and buffs out surface scratches. Using the eraser regularly helps maintain optimal performance of sharpening rods. Additionally, Lansky's all-purpose tool can be used on sports equipment, knives, firearms or other metal objects. Remove rust, grime and tough stains from hard surfaces, such as steel, brass or porcelain.